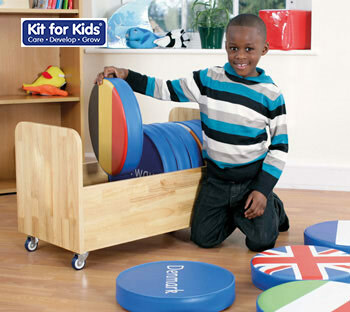  Classroom essential this multi-cushion trolley holds 12 brightly coloured floor cushions. 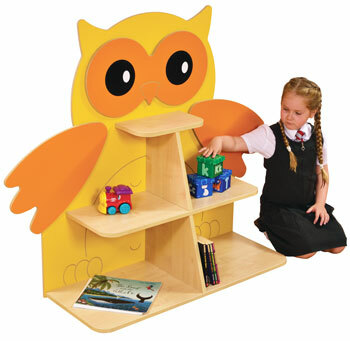  Ideal for group reading/teaching activities, allowing easy and mobile out-of-the-way storage when not in use. 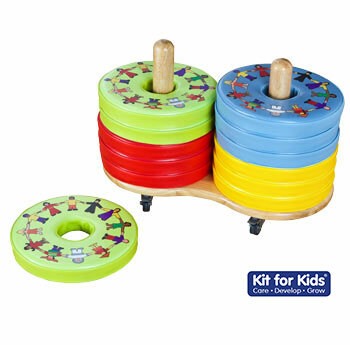  Handmade solid wood trolley and the cushions meet relevant safety standards. 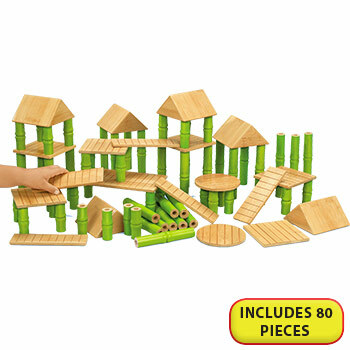  Product made with hardwood selected from sustainable forests.  Cushion colour ways may vary.  Can be wiped clean. 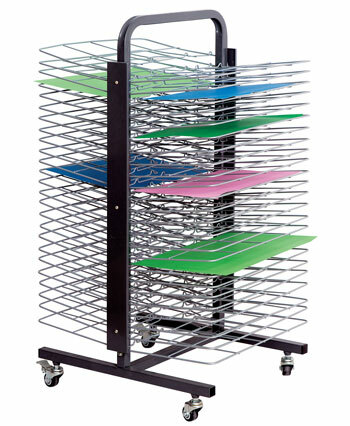  Dimensions of trolley: (HxWxD) 430mm x 700 x 360mm.  Dimensions of individual cushion: (HxD) 50 x 350mm. 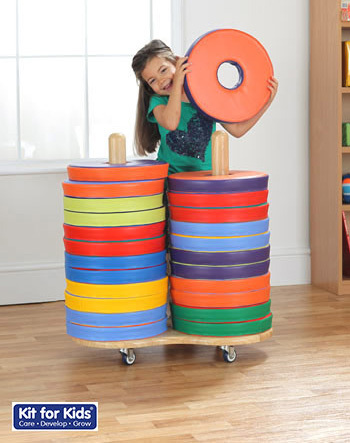  Classroom essential this multi-cushion trolley holds 24 brightly coloured floor cushions.  Dimensions of trolley: (HxWxD) 730 x 700 x 360mm. 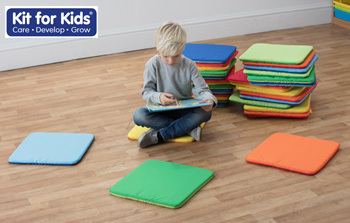 12 brightly coloured floor cushions, ideal for group reading/teaching activities. 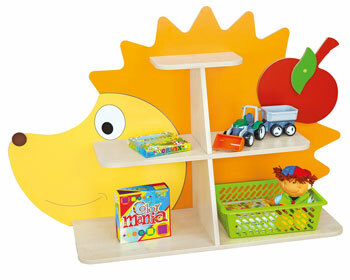 Handmade, high quality solid wooden cushion storage trolley. Ideal mobile storage unit for our circular floor cushion ranges (holds 12 cushions). 4 castors, 2 x lockable. Easy assembly. Dimensions (HxWxD): 380 x 800 x 400mm. 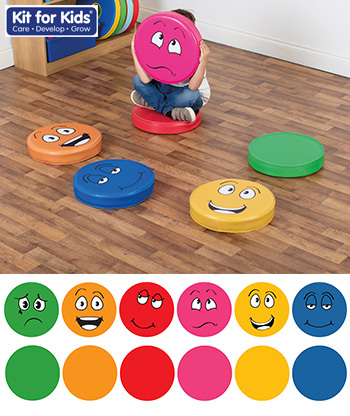 Pack of 12 cushions with different emotions/feelings/ expressions to encourage group discussion. Each cushion has emotion faces printed on one side, text on the other side (See below) Also useable as stepping stones or as story cushions. 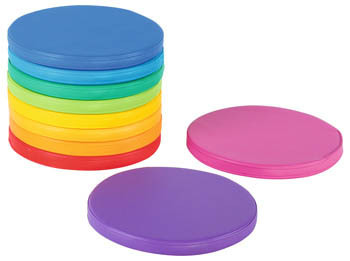  Brightly coloured, soft touch and wipe clean vinyls.  Meets all relevant European safety standards. 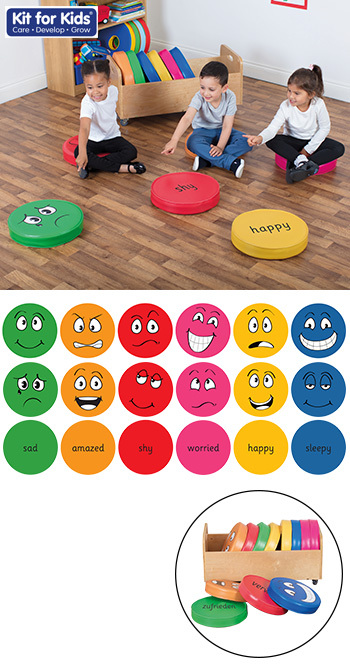 Pack of six cushions with different emotions/feelings/ expressions to encourage group discussion. Each cushion has emotion faces printed on one side, plain on the other. 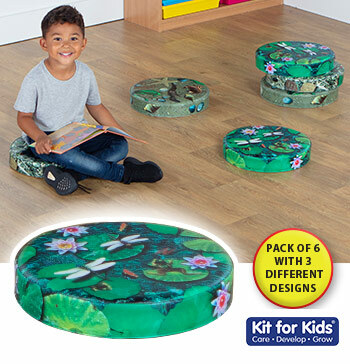 Also useable as stepping stones or as story cushions. 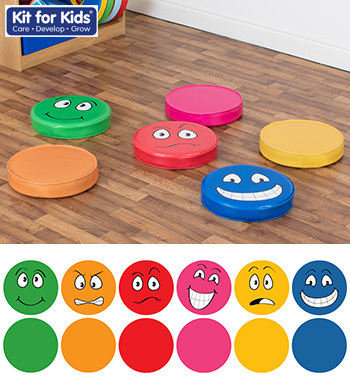  These Emotions Cushions make great "Sit-upons" and can be used indoor or outdoors.  Each cushion features a picture of a face showing an emotion and has the emotion written on the reverse.  Each cushion is made with a thick foam inner and wipe clean polyester outer. 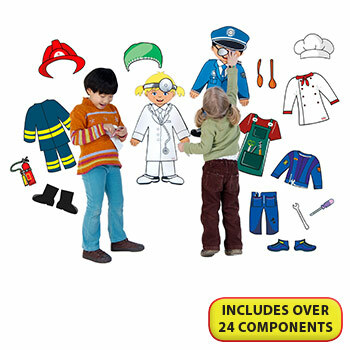  Ideally suited to early years aged children as they are a highly useful learning aid.  Manufactured in the U.K.
 Includes a 1 year guarantee. 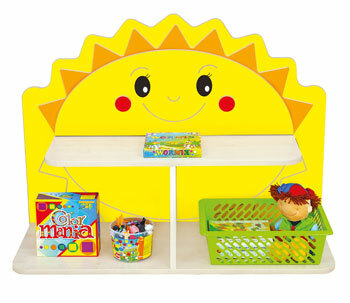 A colourful and practical addition to a reading or play area. 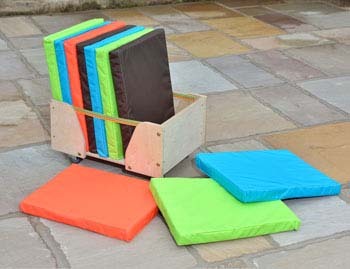 A Set of 10 colourful, high density foam cushions, which are stored neat and tidy in a specially designed natural wood unit. High density foam core resists bending, twisting and sagging. High quality matt finish covers that are easy to clean. 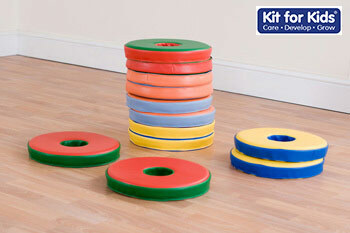  Brightly coloured donut soft cushions recommended for floor seating and group placement. 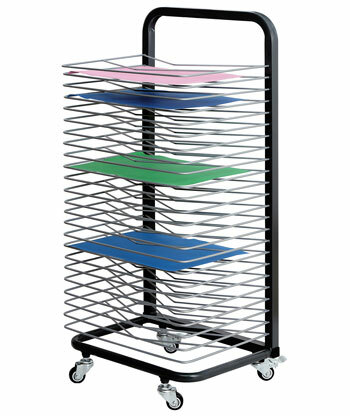  Dimensions of trolley: (HxWxD) 430 x 700 x 360mm.  These cushion packs are suitable for use as individual cushions or together for a large tesselating pattern. 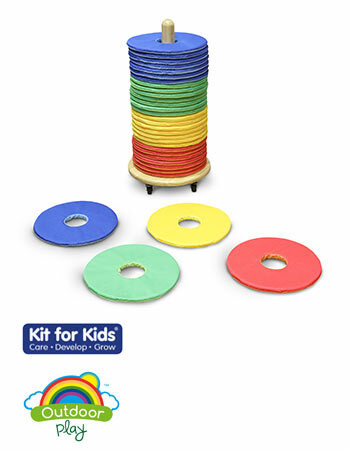  Easy to transport and store, they make a great resource for sharing between classrooms.  Can also be used in conjunction with Tessel 3 cushions.  Available in two colour sets: vibrant (green, red, blue and yellow) or grey and lime green. 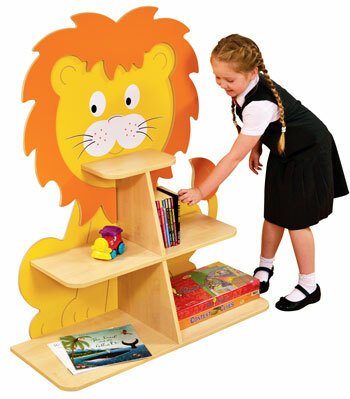  Manufactured from high quality, durable wipe clean PVC.  Please allow 3 weeks for delivery.  These cushion packs are suitable for use as 3 seater cushions or together for a larger tessellating pattern.  Can also be used in conjunction with Tessel+ cushions.  50 x 1265 x 330mm. 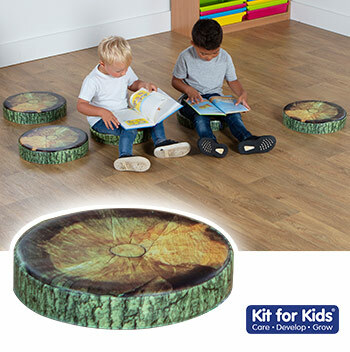  An innovative woodland range with realistic designs to fire curiosity and imagination and bring the outdoors in to the classroom environment.  Featuring stunning high quality digital prints, these cushions offer versatility and great value for money.  Manufactured from high quality, wipe clean PVC.  5 cushions with different designs.  6 cushions with 3 different designs.  5 cushions with same design. 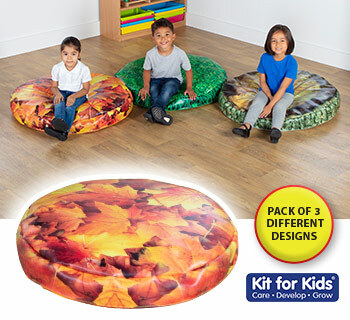  Featuring stunning high quality digital prints, these giant bean bags offer versatility and great value for money.  3 bags with different designs. 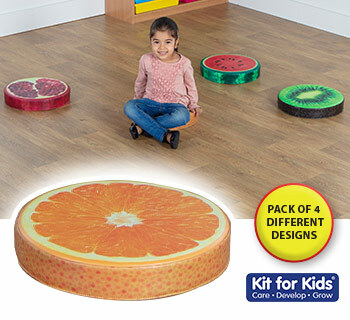  As health and wellbeing become increasingly important classroom topics, this fun fruit range is the perfect new addition to the teaching environment.  4 cushions with different designs. As above product but SAVE 10% when you purchase this double pack! 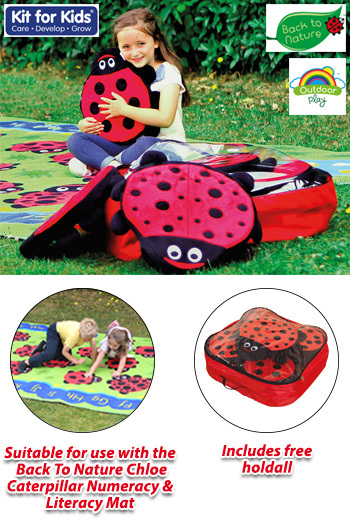  A premium range of brightly coloured ladybird floor cushions. 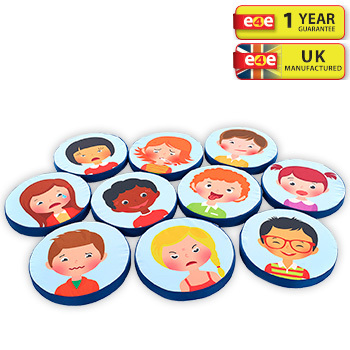  Pack of 13 includes: 12 smaller ladybird cushions, numbering from 1 to 12 and 1 larger teacher ladybird cushion.  Encourages numeracy skills, great for group activities and quiet reading times. 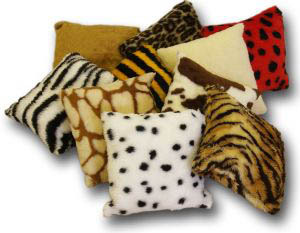  Comfortable, plush materials with varying soft textures, ideal for children to cuddle up to.  Available with a free holdall for easy-out-of-the-way storage. 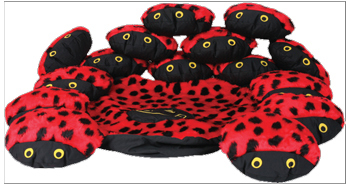  Pack of 13 includes 12 smaller ladybirds, 1 larger teacher ladybird cushion.  Dimensions per cushion: (HxD) 40 x 390mm.  Dimensions per teacher cushion: (HxD) 40 x 480mm.  Durable pastel coloured waterproof wipe clean cushions. 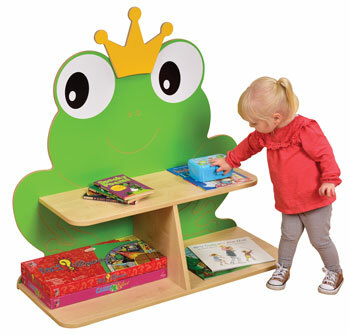  Great for group seating areas and reading time. 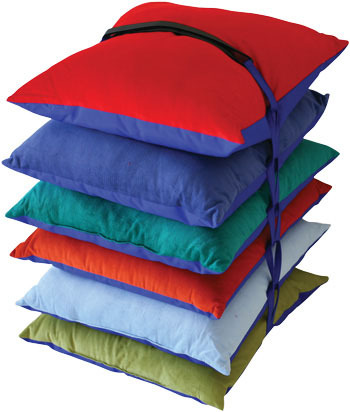  Pack of 10 story cushions supplied.  Made to exacting quality standards and finished in a soft touch durable vinyl, meeting all relevant safety and fire standards.  Colour ways may vary.  Dimensions: (HxD) 75mm x 500mm. 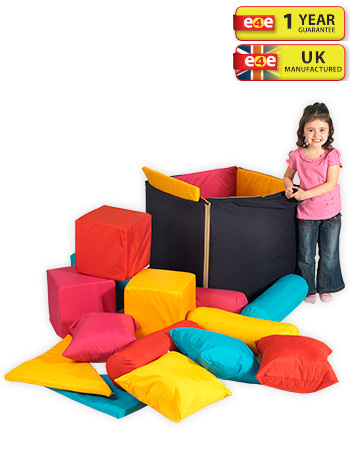  Giant Bean Bags, Excellent for seating or sleeping. 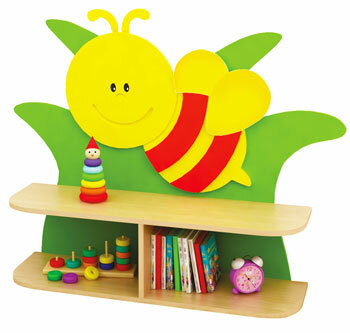  Designed to surround and support a child and maintain shape.  Pack of 3 Bags supplied.  Wipe clean waterproof soft touch quality vinyl.  Dimensions: (HxD) 100 x 900mm.  The seating cube is an ingenious design and encases 16 cushions of different shapes and sizes. 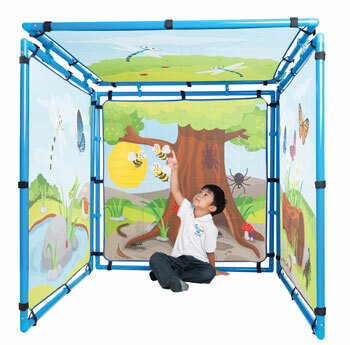  The cube can be unzipped to create a checkerboard playmat. 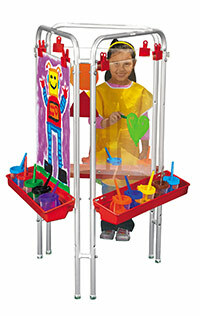  Once it has been used it can be zipped back together to reform the cube for easy storage.  Ideal for pre-school and primary school aged children.  The cushions and the mat are made from wipe clean fabric. 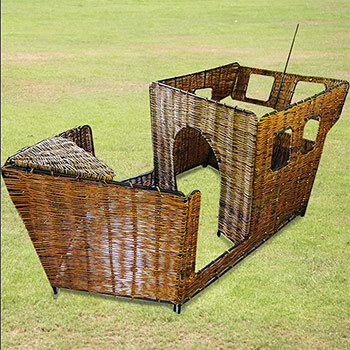  Can be used either indoors or outdoors.  Dimensions of cube: (HxWxD) 670 x 670 x 720mm.  This range of beautiful soft scatter cushions are ideal to create comfy areas around your setting.  Actual fabrics and shades will vary due to availability. 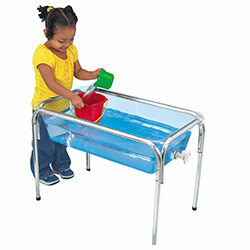  Covers are removable for washing. 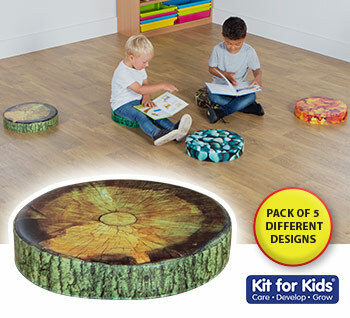  Designed to be the perfect addition to carpet time, these scatter cushions are an exciting treat for fidegty children and help to denote the desired seating area.  Hand these out the next time you need full attention and you will see a transformation in carpet time concentration.  Available in a range of vibrant colours: sky blue, sunflower yellow, orange, pink, purple, lime, navy, brown, red, grey, royal blue, black, cream, forest green, olive green, chocolate brown or white.  Includes a carry bag.  Available in two materials: Indoor/Outdoor (woven polyester ideal for lounging in gardens or living rooms) or Faux Leather (an ideal alternative to leather).  The Indoor / Outdoor fabric is shower proof and UV resistant, meaning the sun and rain will not damage bean bags made in this material. However, these bean bags are not full waterproof and should not be left uncovered if raining.  Made with tamper resistant double zips. 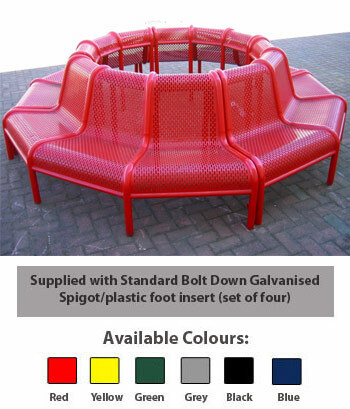  Flame retardant to the British Standards for School/Educational Environments.  Dimensions per scatter cushion: 400 x 400mm.  Please allow 7-10 days for delivery.  A maximum of three colours may be chosen for the cushions in this set. Three cushions of each colour are supplied per pack. 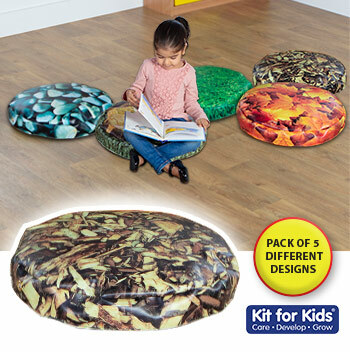 A set of 20 seat cushions which are ideal for comfortable group seating during story time or play. Children can even practice their colour recognition. Made from easily wipe clean pvc and foam. Meets all relevant safety standards. A convenient and mobile wood stand for storing and transporting seat cushions. 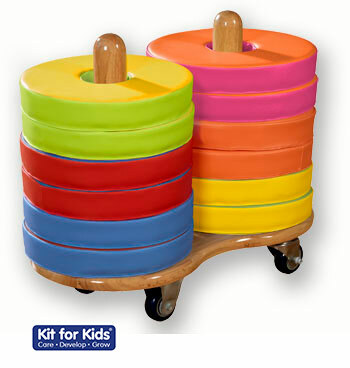 Handmade, high quality solid wooden cushion storage trolley. 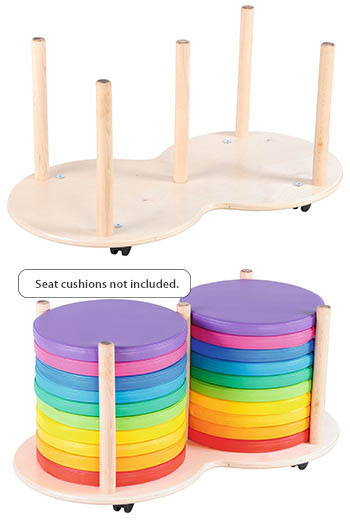 Ideal mobile storage unit for our circular floor cushion ranges (holds 12 cushions). 4 castors, 2 x lockable. 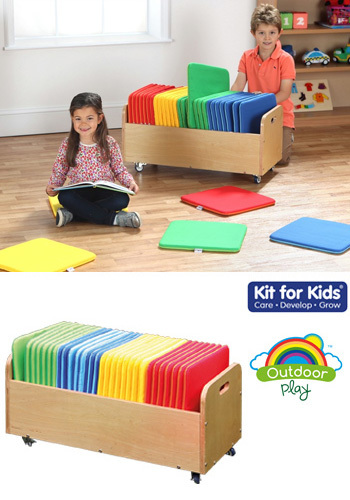 A Quality wooden trolley containing 10 Indoor / Outdoor children's seating cushions. Constructed in the UK from exterior grade 15mm birch plywood. 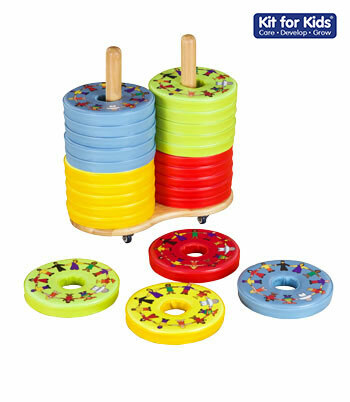 4 heavy duty castors allow the trolley to be used outside as well as indoors. The Bretton Mat Trolley contains 10 seating mats made in the UK from durable water resistant nylon. Sheep, cow, bee, ladybird, dalmatian, tiger, bear, leopard, giraffe, zebra. All soft and cuddly. Lots of discussion points with 10 different prints. 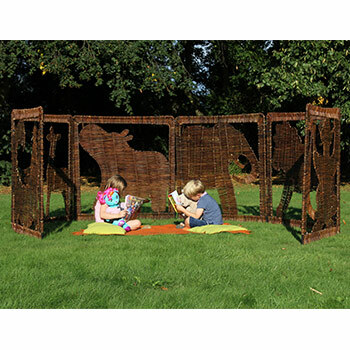 Useful for jungle and farmyard themes. 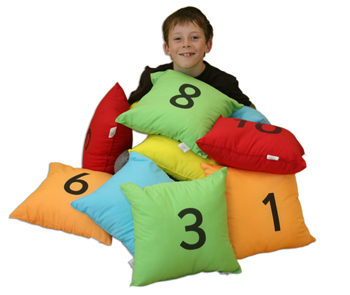 A set of 10 cushions in bright colours with printed numbers on one side 1 to 10. These cushions are also different shapes and so they can be used for early number and shape recognition. Also useful for colour recognition. Poly/cotton. Washable at 30 deg. 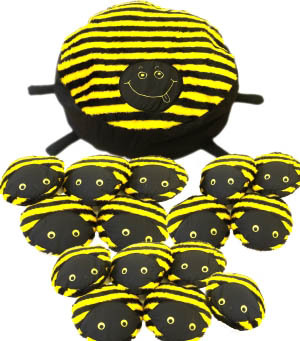 Large bee cushion store and 15 baby bees which can be stored inside it. The large furry ladybird cushion store holds 15 inquisitive babies. Outer - 760mm x 300mm x 760mm Babies 350mm diameter. 30 brightly coloured cushions neatly packed in hanging cushion store.